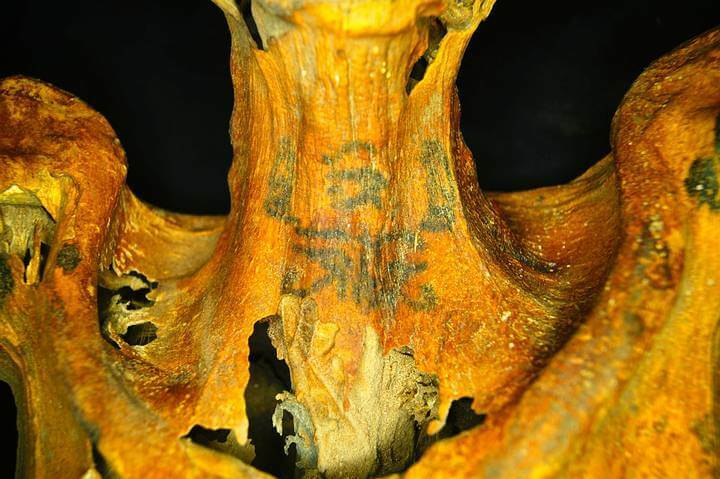 These are some of the spectacular tattoos found on the body of an Egyptian mummy. Its discoverers believe they were probably sacred symbols, which could serve to emphasize religious powers of the woman who decorated her body with these images over 3,000 years ago. Tattoo on the front of the neck. Two baboons sitting flanking the eye of Horus (also called Wadjet), a symbol of protection. These tattoos, whose discovery was announced today at a conference held in California archeology, are the first in a mummy Dynastic Egypt that show real objects. Only a few ancient Egyptian mummies exhibit tattoos, and are nothing more than patterns of dots or dashes. Especially prominent among the new tattoos are called “Eye of Horus’ possible symbols of protection from evil adorning the neck, shoulders and back. “From any angle you look at this woman, a pair of divine eyes will stare back,” says Anne Austin, an archaeologist at Stanford University in California, who presented the results at a meeting of the American Association of Physical Anthropologists. This improved skin mummy tattoos image reveals two cows. Austin discovered the tattoos while examining mummies for the French Institute of Oriental Archaeology, which conducts research in Deir el-Medina, a village that was once home to the ancient craftsmen who worked on the tombs in the nearby Valley of the Kings, reports Nature. While analyzing a headless torsos arms dating from 1300-1070 BC, Austin noticed marks on her neck. At first, he thought it had been painted, but soon realized that they were tattoos. Archaeologist knew of tattoos using other mummies discovered in infrared image, which looks deeper into the skin than visible light images. With the help of infrared illumination and an infrared sensor, Austin determined that the mummy of Deir el-Medina has more than 30 tattoos, including some obscured by the resins used in the mummification that were invisible to the eye. Anthropologist Ghada Darwish Al-Khafif uses infrared to examine tattoos on the back of the mummy. Tattoos identified so far carry a powerful religious significance. Many, like cows, are associated with the goddess Hathor, one of the most prominent deities in ancient Egypt. The symbols in the throat and arms may have been intended to give women a boost of magical power as she sang or played music during rituals of Hathor. “Tattoos can also be a public expression of religious virtue of women,” says Emily Teeter, an Egyptologist at the University of Chicago in Illinois. “Until now we did not know this type of expression,” says Teeter, adding that she and other colleagues were “shocked” when they learned of the discovery.